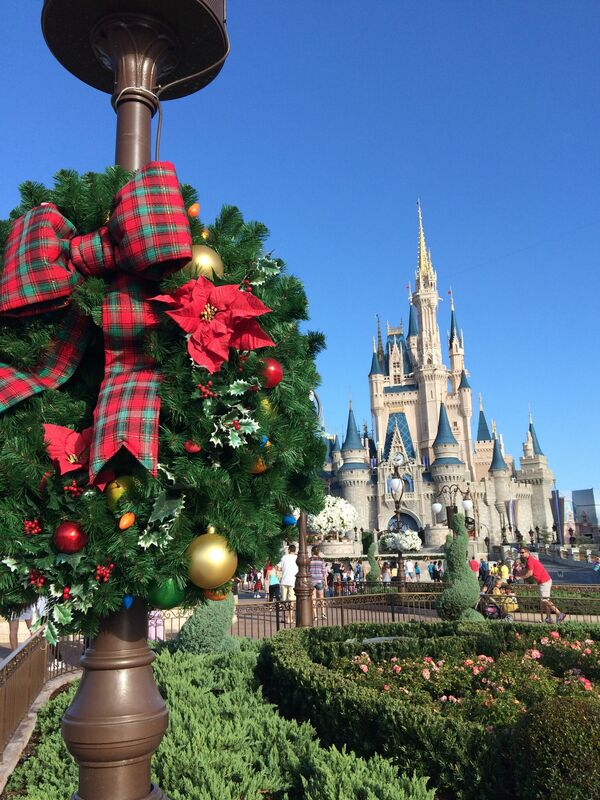 Planning a trip to Walt Disney World for a family of five or more can be tricky. Planning a Disney Cruise Line trip for a family of five or more can be downright mind-boggling. The choices feel simultaneously too few and too many. 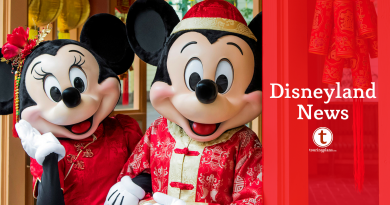 To make things a bit easier, I’m going to walk you through some of the things you need to know when planning a Disney Cruise for a larger party. Most stateroom categories won’t allow five people in one room. If you have a party of five, even if you can all stay in the same room, you might not want to. On the Dream and Fantasy, a category 4 stateroom, which can accommodate five guests, runs approximately 300 square feet, including the verandah. At the full capacity of five guests, that gives each person 60 square feet, some of which is bathroom and outdoor space, and most of which is consumed by the bed and other furniture. Also on the Dream and Fantasy, a category 8 stateroom (an oceanview with no verandah), which allows five guests, is approximately 240 square feet total, or 48 square feet per person, much of which is consumed by the bathroom and furniture. And consider that you’ll have five people’s worth of luggage to store, devices to charge, and toiletries to contain, and you’ll soon realize how quickly cozy can turn into cranky. To get anything approaching real comfort for five people in one stateroom, you’d have to go up to a Category T one-bedroom suite, which has about 600 square feet total, or 120 square feet per person. Your use of the room is likely to be different on a ship than it would be at the theme parks. I’ve been on plenty of Walt Disney World vacations where I left my hotel room at 7:30am and returned at 11:00pm to just to shower and sleep. I was too far away and too occupied in the parks to go back to my room. This type of room avoidance is unlikely on a cruise. There’s certainly plenty to do on the ships, but chances are you’ll be in and out of your room much more often on board than you would be at theme parks, even if only to change clothes. On board a ship, guests often find a need to change frequently. On a typical day, you might be in and out of exercise clothes, swim clothes, casual attire, and formal dinner attire, then back to swim or casual attire. If one person wants to nap and another person needs to change, there’s not much room for quiet and privacy with only 48 square feet to call your own. From a comfort and financial perspective, you may be better off using two staterooms. 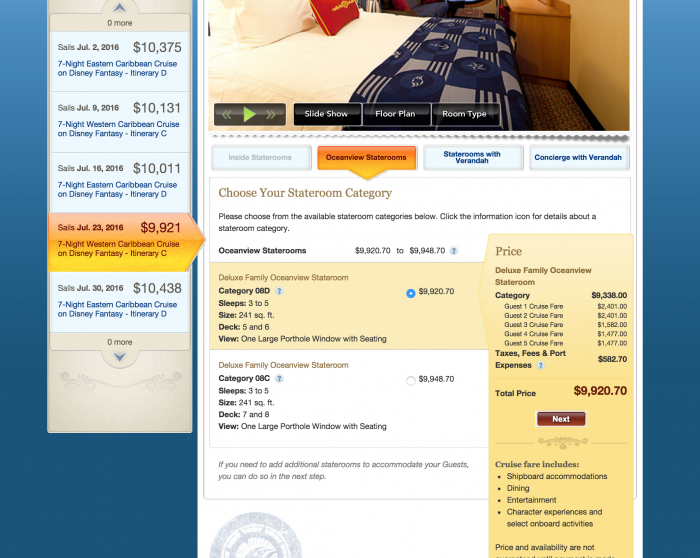 Stateroom pricing is quite variable. The same room might be a drastically different price depending on your sail date and the date on which you book the cruise. So that I’m comparing apples to apples, the prices I’m about to note were all found on the same date for the same cruise. You might encounter different pricing if you conduct your own search. For the July 23, 2016 Western Caribbean sailing of the Fantasy, the least expensive stateroom available which allowed five guests into one stateroom is a 240 square foot category 8D. This is priced at $9,920.70 if the guests are two adults, two kids under age 10, and a teen. For that same cruise for the same party, the 614 square foot 1-bedroom suite listed at $25,992.70. To get comfortable space, you’d have to pay more than twice the price. And what a price it is! At the time of my search, the very least expensive rooms available for that cruise were standard inside staterooms at category 11C, at 169 square feet each. Placing three guests (two adults and a five year old) in an 11C is $6,250.62; placing two guests in an 11C is $4,657.08; giving a grand total of $10,907.70 for five guests housed in two 11C staterooms. If your party of five were in two 11Cs instead of one 8D, you’d spend an extra $987. That’s certainly not nothing, but in the grand scheme of an overall vacation expense, it might not be everything. For your extra money, you’d gain nearly 100 square feet and a bathroom, plus more storage areas, more outlets, and more sleep surfaces. You’d also have virtual portholes instead of real ones. The pricing on that same cruise for a 4D (an oceanview with a verandah) is $10,865.70. If your party of five were in those two 11Cs instead of one 4D, you’d save $42.00, and gain about 40 square feet of living space, plus the extra shower, etc. In this scenario you’d be losing the outdoor space from the verandah. This might be a real negative for some guests, but for others who mostly want a womb-like dark rocking environment to sleep in, this could be a big positive. There are plenty of rooms with connecting doors on the ships. Families with young children might worry about putting little ones in a different cabin. Never fear! 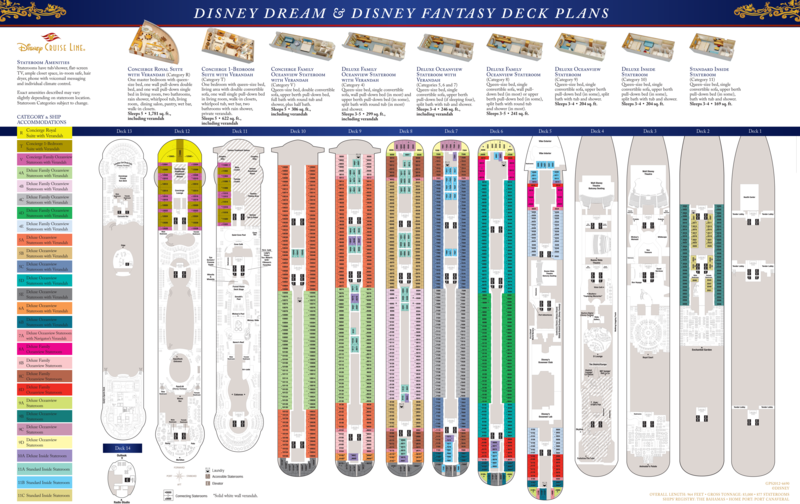 Break out your magnifying glass for a look at the deck plans and you’ll see that many of the staterooms on the Disney ships are connected by an internal door. (Look for the little V-shaped symbol between the rooms to indicate that the rooms are connected. Seriously, you may need a magnifying glass to see them.) Connecting rooms are available at most stateroom levels, from standard category 11 inside staterooms, on up to concierge suites. There are even a few concierge rooms which allow more than two rooms to be connected. See the little triangles and Vs – those mean that the rooms connect via an internal door. Connecting rooms are exactly what they sound like, two rooms connected by an internal door. Opening the internal door effectively turns those cabins into a multi-room suite. In addition to adding space, selecting connecting rooms gives you a real door in addition to the flimsy internal “privacy curtains” present in most rooms. For a couple traveling with kids, this could greatly facilitate the ease and comfort of their, um, conjugal time. Connecting rooms are not all alike. In most instances, connecting rooms are listed at the same category level. For example, an 11B is connected to an 11B or a 4C is connected to a 4C. However, there are a few unique situations in which staterooms of different categories connected. 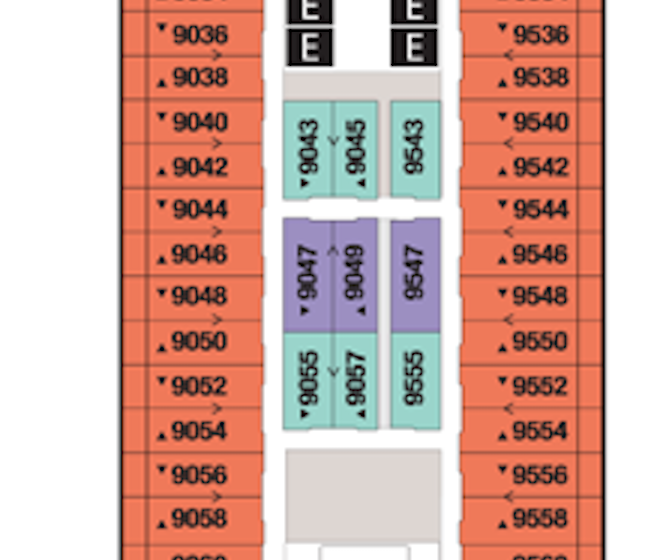 For example, on the Dream and Fantasy, stateroom 7188 (a 6B cabin) can connect to 7190 (a 5E cabin). These staterooms are quite similar, but a bit of tinkering with various combinations might save you a few dollars. The most common situation in which you’ll find dissimilar staterooms connected occurs when one of the staterooms has a handicap accessible designation. For example, on the Dream and Fantasy, you’ll see handicap accessible stateroom 6186 (a 9A deluxe oceanview cabin) connected to 6188 (a 6B deluxe oceanview cabin with a verandah). For many parties, this would be a nice balance of economy and outdoor access, with one slightly less expensive room connected to a slightly more expensive room with an additional amenity. Of course, the priority access in this situation should go to guests who need the handicap room for medical reasons, but if theses rooms become available for general booking, it could be the best of two worlds. If you’re looking for odd stateroom combinations, you may benefit from the expertise of a veteran cruise specialist travel agent who understands the nuances of the various options. Your options expand further if you don’t need your rooms to connect. While parents of small or special needs children will likely want access to them via a connecting door, families with older kids, or a party of friends rather than family, might not need their rooms to be connected. My three children are older teens. When we travel, I like to have them in a room fairly close to my husband and me, but they’re experienced enough travelers that I don’t absolutely need them to be in a connected room. If you just want adjacent but not connected rooms, the stateroom type combinations increase dramatically. 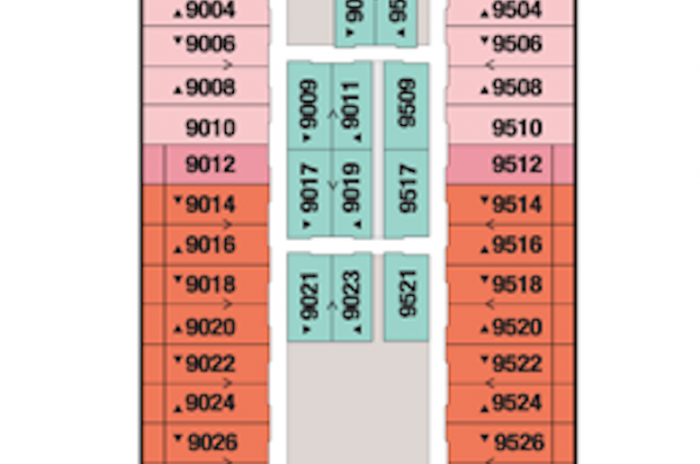 For example, on the Dream and Fantasy, cabin 9010 is an 8B oceanview stateroom next to (but not connected to) 9012, a 7A stateroom with a navigator’s verandah. This could be a good combination savings and outdoor access for my family, particularly if something like the connecting door handicap room combinations were not available. There are also many families who put teens in an inside stateroom with the parents in an oceanview or oceanview with verandah room directly across the hall (for example 9101 and 9098, or 2044 and 2045, on the Dream and Fantasy). Again, this allows cost savings in one room with better amenities in the other. 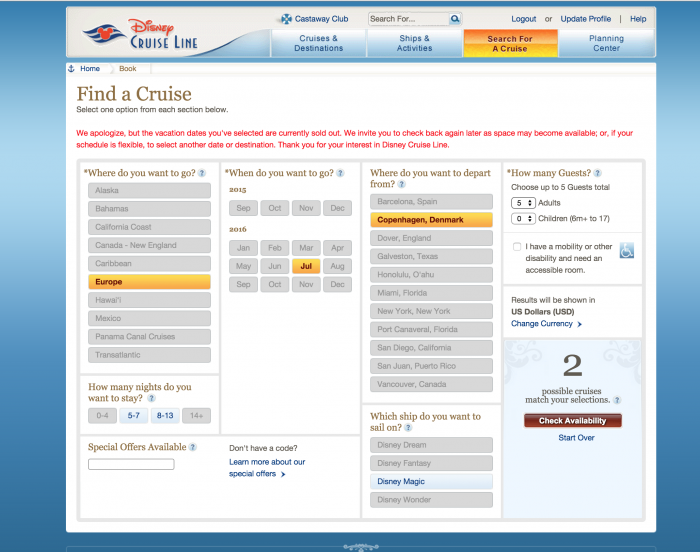 When trying to book a room on the Disney Cruise Line website, it may look like your party size can not be accommodated at all. Depending on the sailing, parties of five or more may encounter messages that no staterooms are available for them. For example, when I select a party of five, it looks like neither of the Magic’s July sailings from Copenhagen have availability for my group. However, when I dig a little deeper, I find that there are plenty of lower category staterooms available for smaller party sizes. My party of five could easily be accommodated on those sailing if we’re willing to book two staterooms. If you get the “sold out” message when searching for rooms for a larger party, take that information with a grain of salt. Depending on the ages of your party, Disney may not allow you to book two rooms for your party of five or more. While getting two rooms for your larger party is often an elegant solution, it may not be possible in all cases. Disney Cruise Line requires that at least one guest age 21 or over be booked into every stateroom. This is different from Walt Disney World, where the minimum age requirement is 18. This is no problem if, for example, two adults are traveling with three kids. Two get two rooms, you would book an adult with one child into one cabin, and the other adult and two children into the second cabin. However, if one adult is traveling with four children, then they would not be eligible to be booked into two staterooms. On the Dream and Fantasy, their only option would be one category 8 room or a one category 4 or higher room, assuming one is available. This is true regardless of whether the rooms are connecting and regardless of the age of the children. A single parent of four teens would have to stay with them in one stateroom rather than two. This rule has other impacts as well. I recently considered taking two of my teen daughters and a friend of theirs on a DCL cruise. While my daughters are quite close with their friend, I didn’t think she would be entirely comfortable sleeping/changing/relaxing in the same room with me (a non-family member) for a week. I wanted to get a room for the girls (again, well-behaved older teens) connected to a room for me to give everyone a measure of privacy, but Disney would not allow me to do this. We ended up scrapping our plans. Where you book is not necessarily where you sleep. I mentioned earlier that some families put their teens in an inside stateroom with the parents across the hall in a verandah or oceanview stateroom. Given the 21-and-over rule, you’ll see that this is not allowed from a booking perspective. However, once you’re actually on the ship, the rule is not enforced. If you’re a family traveling with more than one stateroom, Guest Services at the ship will be more than happy to code your Key to the World Cards (room keys) so that each key opens all the linked rooms. This means that on the ship, family members are free to mix and match their sleeping locations among the reserved rooms. Even though it’s not booked that way, mom and dad can sleep in one room, with the kids in another. Which guest is booked into which stateroom might have a small financial impact. The first two guests booked into any stateroom are always priced at the same adult fare rate, regardless of the guests’ ages. Only after the first two guests do you being to reap any price breaks for children. It’s important to note that older children are often priced slightly higher than younger children. For example, on the July 23, 2016 sailing on the Fantasy, the basic first and second guest rate for an 11C stateroom (at the time that I searched) was $2,212. After the first two guests in the stateroom, teens are $1,582 each, while younger children are $1,477 each (again, at the time I searched). Let’s take a hypothetical family with two adults, 16-year-old twins, and a 4-year-old. If you book mom and the 4-year-old into stateroom 1, their rate will be $2,212 each, for a total of $4,424, plus taxes and port fees. The other room will have dad at $2,212, teen twin A at $2,212, and teen twin B at $1,582 (the older child rate), for a total of $6,006, plus taxes and fees. Giving the family a grand total fee of $10,430. However, if instead you book mom and twin A into stateroom 1, their rate is still $2,212 x 2 for a total of $4,424. In the other room you would have dad at $2,212, twin B at $2,212, and the 4-year-old at $1,477. Giving the family a total of $10,325, plus taxes and fees. By doing nothing but slightly changing the composition of the booking, the family saves $105, not a huge amount, but every little bit counts. Your ability to book excursions and fine dining may be impacted by who is booked into which stateroom. My twins and I have a higher Castaway Club rating than my husband and other daughter (lucky us). My kids are all older, so we have no pricing issues with who gets paper-booked into which cabin. However, we did run into a problem recently when trying to book excursions for an upcoming DCL cruise. We inadvertently booked me and the higher Castaway status twins into one room, while my husband and lower status Castaway status daughter were in the other room. Excursion and dining booking access dates are based on the Castaway level of the highest status person in each room. Because we had stacked the deck with all the high-status family members in one of our rooms, half of our party was able to make excursion reservations before the other half. If we had arranged the booking slightly differently, booking one of the higher-status kids into the room with her dad, we would have been able to make excursion reservations for both rooms at the same time. The excursions we were selecting were not in short supply, so as a practical matter it ended up as a non-issue, but if you were looking to book an extremely popular or scarce excursion, then you might be in trouble. The number or size or style of the of the sleep surfaces may be an issue. If you’re putting five guests into one category 8 or category 4 stateroom, your sleep surfaces will be one queen sized bed, one twin-size sleeper sofa, a twin-size Murphy bed, and a twin-size bed that pulls down from the ceiling. This set-up requires that two of the guests sleep in the same bed. It might also be tight for any guest who is physically larger than average. Contrast this with putting five guests into two 11C staterooms. This combination would give the party two queen beds, two twin sleeper sofas, and likely two twin beds that pull down from the ceiling. There is the possibility that each guest could have his or her own sleep surface. This can be helpful if the members of the party are friends rather than family, if the guests are physically larger, or if there is more than one guest with a fear of heights who doesn’t want to sleep in a bunk-like situation. The sofa bed and Murphy bed made up. Stateroom 9502, an 8B, on the Fantasy. Sofa bed and pull-down berth on the Magic. You don’t have to shower in your room. If you do decide to squeeze five people into a non-suite stateroom, there are things you can do to make yourselves more comfortable. For example, any adult guest is welcome to shower in the regular spa area at no additional fee, or to purchase admission to the upgraded Rainforest Room spa/shower lounge area. If you’ve got more than two adults in any stateroom, making use of the spa showers can make getting ready for the day much faster and less contentious. You may need a waiver to take your own child on an excursion. If a child is going to leave the ship with any adult other than the adult(s) in his own stateroom, there must be a waiver on file with Guest Services. The waiver must be signed by the adult booked in the child’s stateroom and specify which other adults that child may leave with. This rule applies even for the child’s own parent or grandparent, even if that parent or grandparent is booked into a room that is connected to the child’s room. For example, let’s say Mom is booked in a stateroom with child A, while Dad is booked in a connecting stateroom with children B and C. Mom could take child A out for a walk around Nassau, but could not take child B with them unless Dad had signed a waiver. It only takes a second to do this, but it’s something that people often forget about until they’re scrambling find the other parent as a port excursion is about to depart. If you’re not in a room with all your kids, sign the waiver on the first day and get it over with. With lots of people in a small stateroom, organization and cleanliness is key. I spent 11 nights this summer in a 214 square foot category 9A stateroom with my husband and two of my daughters. This gave us a paltry 53 square feet per person. We emerged from the trip still speaking to each other, but just barely. 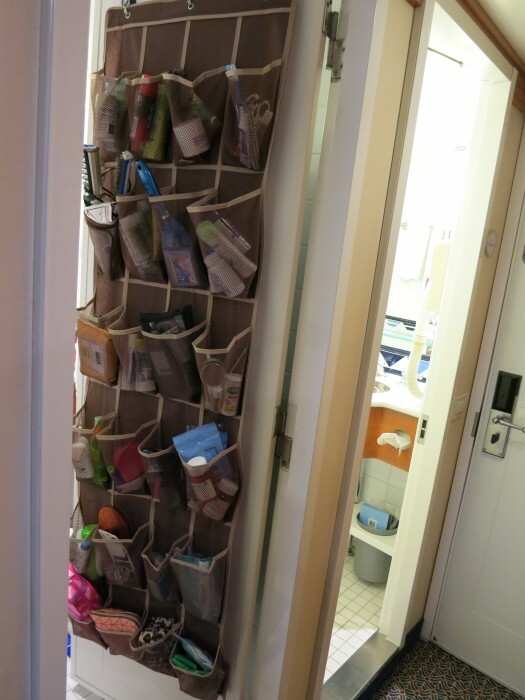 My husband swears that the only thing that kept us from killing each other was a shoe rack we hung from the bathroom door (with magnets) to contain the teen girls’ many lotions and potions. We were also quite meticulous about organizing the room several times a day – throwing out stray papers, putting all clothing in drawers or closets, keeping all suitcases under the bed, etc. Again, we survived, but if you were not fastidious with organization or if you had small kids with lots of toys, strollers, or other equipment, the small space would pose additional challenges. What other issues have you encountered as a larger party? Do you have any tips and tricks for booking parties of five or six? Do you have any cost savings strategies? Would you rather be in one room or two? Let us know in the comments below. Excellent blog! Although we are a family of 4, with kids growing, space challenges are expected in our future. I didn’t know about the showers at the spa. I’ve been there only for a quick tour (Dream) and the raffle (Fantasy), where exactly are the “free” showers? On a 3-day cruise on the Dream this past December, my party of 5 adults split between 2 verandah rooms nowhere near each other on the ship. This worked out fine. The chat feature of the Disney Cruise app wasn’t working so well at that time, but I’ve heard Disney has fixed that. With the chat feature and the Wave phones, we didn’t have a problem coordinating schedules. I’ll second the idea of using the fitness center shower. I’d be reluctant to share this secret, but every time I used the shower, I was the only one in the locker room. Slip-on sandals are provided to prevent fungal infections, but I brought my own shower shoes. The showers in the locker rooms are huge — much larger than my shower at home. There’s a dressing room separated from the locker room by a curtain. In the dressing room there are a few wall hooks, a bench, and a bath mat. A second curtain separates the shower from the dressing room. Shampoo and liquid soap are provided in the shower and there are plenty of towels in the locker room. A party of 5 also worked out great at Serenity Bay. Just as we were about to give up on finding a spot, someone offered us the two hammocks to the left of the beach entrance. The boys went and had lunch while the girls enjoyed the hammocks, then we swapped. My family of 5 traveled on the 5-night Wonder Caribbean cruise last year and we were very comfortable (kids were 10, 8, and 6 at the time). 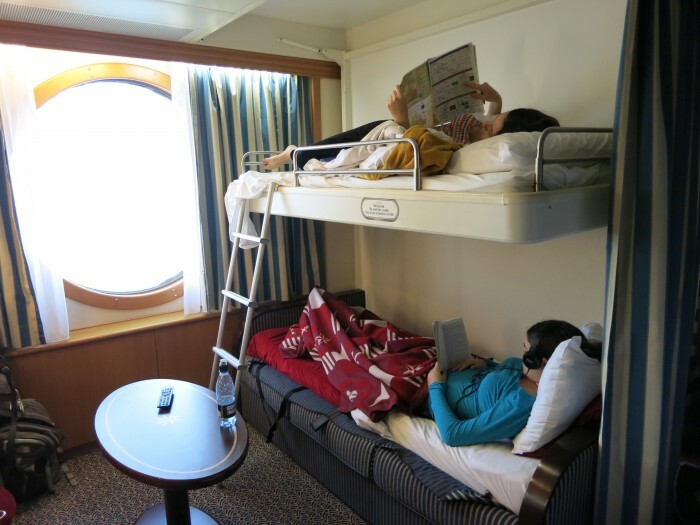 We had the largest family stateroom with verandah and there was plenty of room for us. I was worried about the space beforehand because I am a very light sleeper and I don’t like tight quarters, but the dividing curtain gave the illusion of privacy and we all had room for our luggage (the space under the bed is very helpful). When they are all teenagers, we will probably want a second room, but for now, the family stateroom with verandah is more than adequate. Not only is the rule about one adult in each cabin not enforced on connecting statements, in our experience it may be de facto assumed by the cabin stewards that all kids will be in one room and the adults will be in the other. When we traveled on the Fantasy in April of 2014 we had connecting staterooms. The cabin steward was there when our luggage arrived, and he asked the kids which luggage was theirs, then promptly took all three kids’ luggage into one side and all ours into the other without even asking where anyone was planning to sleep. We just returned from a 7 day cruise on the Fantasy with our family of 6, booking two cabins. Important to us was that each child have their own sleep surface, none of my daughters like to share a bed. We were also interested in keeping the kids in one room, and parents in another – mainly so that my night owl children wouldn’t wake us up when returning from the kids clubs! We booked two 8C connecting staterooms, three to each room, ensuring that one of the staterooms slept 5 (4 sleeping surfaces). This worked out great. One other perk for having the kids all in one room is that we would order room service for the kids breakfast delivered to our room while they were still sleeping. Then we could quietly put their breakfast in their room while we parents headed to Cabanas and they ate whenever they woke up. That also gave our cabin hostess a break, as she could get into our room (we shut the connecting door) as soon as we left, and not having to wait for my late risers to make up both rooms. 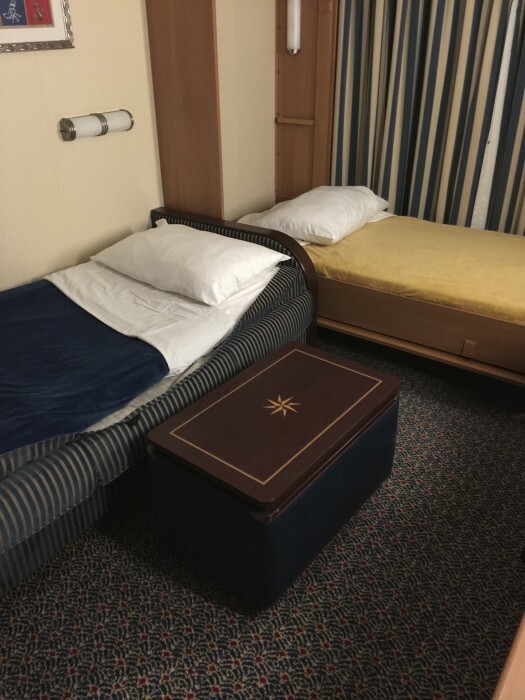 Traveling with 6 on a Disney cruise isn’t for those with a thin wallet, but the 5 person configuration of a connecting stateroom made the experience very enjoyable, and we didn’t feel cramped for space at all.